Online trolls are funny but sometimes they are demeaning and nasty. Recently, an online troll likened Salman Khan's sister Arpita's son Ahil to "a polio-afflicted kid", which led to her blasting at them. The comment came for a video that shows Salim Khan cutting cake on Ahil's birthday. The video was then posted on Instagram that invited this unwanted and disgusting comment. Arpita was quick to hit back. She replied to the comment saying, "Guys, you are disgusting. At least spare children in your negative comments." This is not the first time that an exchange of heated words has taken place between Arpita and the trolls. She has been at the receiving end of hatred from the online community time and again. 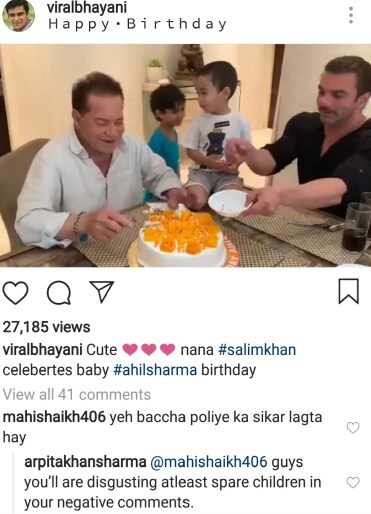 People have questioned her marriage with actor Aayush Sharma and have also commented negatively on her son Ahil's appearance. Earlier in May 2016, Arpita wrote an open letter which read, "Hey, I would request all our well wishers not to waste their time by reacting to random, jobless, insecure, jealous people. Insecurities and jealousy can make you lose the plot at times. Just ignore them and move on. Don't react to their comments as then you are giving them more importance. And for all those people who have an issue with the following: my pictures, my family, my weight, my face, my colour, what I am doing with my baby boy and we are taking care of him and my husband and our lifestyle. I wonder how jobless or bored you are that you are busy following or visiting a profile you don't like and have so many issues with. Why don't you do something better with your times and life rather than stooping down to a level of barking dog and displaying a very low line character of yourself. Anyway, have a great day. God bless."